As a content creator on OnlyFans, you need to build on what gained your fans in the beginning. Most fans will continue to follow you on your free platforms – such as Instagram, YouTube and Facebook – but they are likely to expect an enhanced experience when they pay for a subscription. 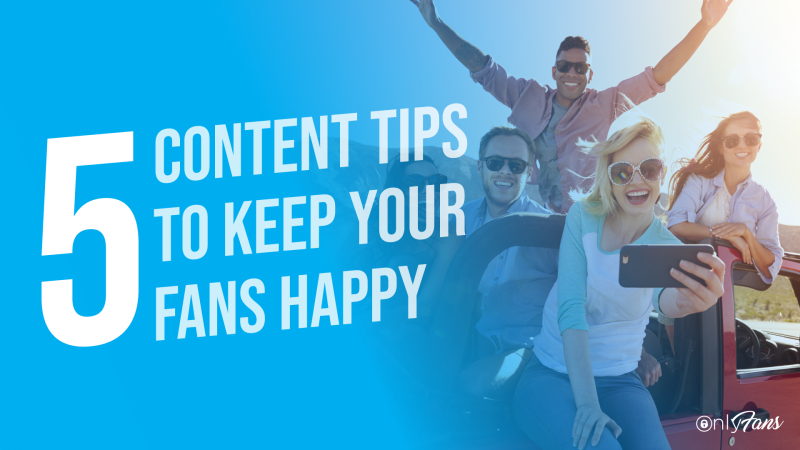 This doesn’t mean a complete shift in your direction, as fans already love what you do, but it does mean thinking about how you can extend your existing content to give more value to subscribers, and how you can introduce new ideas and experiences that your OnlyFans subscribers will value and enjoy. Based on experience with our influencer community, here are 5 top tips to ensure you attract and retain your fans on OnlyFans. Social media influencers have achieved loyal followings because they’re already giving fans what they want. So before you create a new plan from scratch, look at what you do now and what you’ve done from the get-go. Realise why you have attracted a fanbase and think about what you’ve done with your content to reach the point that you’re at. This enables you to form a picture of your most popular content and the things your fans like the most. Understanding the value of your existing content and the power of your influence is a great starting point. The likelihood is that there’s untapped value in what you’re already doing and you can simply extend or add value to that. It may be, as is often the case, that you give too much value for free and are already creating content that fans would be happy to pay for. Whilst it’s advisable not to simply start charging for what fans have always viewed for free, you will be able to expand on what you already do and branch out into relevant topics. For example; if you’re a beauty blogger, think about how you can create more in-depth makeup tutorials, or hone in on specific areas such as the eyes, skin or hair. You can use your mainstream social media to promote a makeup technique and invite your fans to subscribe for a full-length tutorial series on OnlyFans. Giving advice on fashion and what colours complement makeup and hair shades may be something you can bring into play to expand your value to fans too. Similarly, personal trainers can present workouts on their free-to-view platforms and offer more detailed programmes on OnlyFans. Branching out could include advising on the best apparel and training gear. And if you’re a model, you could post selected images from a shoot on Instagram and invite fans to see exclusives and behind the scenes footage on your OnlyFans channel. Two things are key here. One is delivering value for money to the fans and second is education. People are looking for expertise and you have it. Once you have settled on how you can add value on OnlyFans, create a content plan. With your ideas set out for exclusive, extended or enhanced content spanning images and video, decide how often you’re going to post and stick to your plan. Delivering consistently to subscribers is important, so there’s no tidal wave on a beach followed by a drought. If subscribers pay monthly they will expect regular posts. It’s all part of keeping them happy and engaged! Importantly, as with your existing social platforms, make sure you engage and interact with your fans, as it’s a two way street. Using this to your advantage enables you to create a more personalised experience and strengthen the bond between you and your fans. OnlyFans private messaging facility puts your fans in direct contact with you, and you can ask what they would like to see. This way you can tailor your plan to give fans more of what they want. Asking fans what they most want will help you understand their preferences and you can build the most popular requests into your plan. Don’t feel pressurised into upscaling post frequencies because fans are paying. What most expect is quality and consistency. Of course you need to consider levels of content but put quality first as that’s where the true value lies. Value content retains fans and attracts new ones but posting for posting-sake and to fill gaps in your plan may make people wonder what they’re paying for, and we don’t want that! After a time on OnlyFans you’ll see movements in your subscriber base and begin to understand what content is most effective – just like other social platforms. Understanding fan behaviour and how your content is working gives you important intelligence to evolve your plan. In simple terms, focus on what’s working best and do less of what’s least effective.